An atomic swap is a process in which two people holding two different types of cryptocurrencies make a transaction where they swap a certain amount of each currency that is worth the amount that the other is swapping. For example, if cryptocurrency A is worth $10, and cryptocurrency B is worth $5, then an atomic swap could involve a person swapping one unit of cryptocurrency A for two units of cryptocurrency B. In such a case, each person would be left with new cryptocurrency units that have the same value as the ones they exchanged in the swap. Essentially, atomic swaps are a way for people to swap cryptocurrencies directly with one another without incurring any transaction fees, and without having to rely on a Bitcoin exchange or another third party to do so. Atomic swaps are very exciting in the cryptocurrency community because they make every cryptocurrency more liquid and useable. This can help to speed up adoption rates of cryptocurrency by the general public and enable transactions to be made more seamlessly and independently. Why Are Atomic Swaps Needed? There are a number of reasons why atomic swaps are needed. The first reason is because trying to exchange cryptocurrencies peer to peer without them can result in disaster. Doing this relies on the complete trust by each user for each other. For example, Bitcoin is currently valued at around $13,000 (12/6/17) and Litecoin is currently valued at around $100. So assume one man wants to trade one Bitcoin to a woman for 130 Litecoin. Without atomic swaps, one of these people would have to risk sending the money to the other first. This translates to one person exposing himself or herself to a theft worth $13,000. After the money has been sent by the first person, then he or she simply has to wait and see whether or not the other person will send the currency that he or she agreed to send. This can result in a lot of theft. This method of swapping currency is far too risky for most people to consider for large swaps. Swapping cryptocurrencies on exchanges is another method that people currently use to swap cryptocurrencies. Although this method can be a lot more reliable than traditional swaps, it too has negative aspects. Primarily, using exchanges to swap currencies is expensive. Exchanges take money from every single transaction that is made. So, if you are someone who owns many different types of cryptocurrencies, and who has a need to swap them frequently, then you could end up paying exchanges large amounts of money to facilitate currency swaps for you. 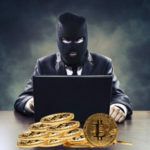 So, while it is possible to conduct cryptocurrency swaps through traditional swaps and through exchanges, both of these methods are not ideal, and both of them have some significant downsides. This is why atomic swaps are needed, and it is why a lot of effort is currently being put forth to try to make atomic swaps more effective, and more widely used. How Exactly Does An Atomic Swap Work? In the world of computer programming, “atomic” refers to a “unitary action or object that is indivisible, unchangeable, whole, and irreducible.” ~ captainaltcoin.com. So, an atomic swap requires a transaction that is complete, solid, and whole in order for it to go through. What this means is that neither party who enters an atomic swap will be able to rip the other one off by taking his or her money without sending money himself or herself. If the trade does not complete in full, then it is cancelled, and both people who entered the swap have their money returned to their accounts. To enter an atomic swap, two different parties must agree on a transaction value. For example, to use the previous example, one person could agree to exchange one Bitcoin for 130 Litecoins. After this happens, both parties must sign a copy of the transaction with private keys. Then, a hashed, time locked transaction will be created. This means that the values exchanged in the transaction will only be able to be spent after a specific amount of time passes. If the atomic swap goes through, and if each party lives up to his or her obligation and deposits the correct amount of cryptocurrency, and signs the contract with his or her private key, then the atomic swap will be completed, and the specified amount of each currency will be exchanged. What Are The Implications of Atomic Swamps? One of the most exciting implications of atomic swaps are that in the near future, when more merchants start accepting Bitcoin and altcoins for payment, people will be able to instantly pay with a wide variety of cryptocurrencies. So, for example, if five people go out to eat at a restaurant, and one person only has Bitcoin, one only has Ethereum, one only has Litecoin, one only has Zcash, and the last one only has Dogecoin, then they could hypothetically all pay for their portion of the bill with their respective cryptocurrencies. This could add an unprecedented amount of liquidity to the cryptocurrency ecosystem. It also can dramatically increase the amount of vendors who accept cryptocurrencies. At the present moment, one of the main reasons why some vendors hesitate to accept cryptocurrencies is because of convertibility issues. Atomic swaps make converting between currencies easier than it has ever been. This just adds to the practical use of cryptocurrency in a very meaningful way. Another implication of atomic swaps is that they could potentially make the value of cryptocurrencies that adopt them rise. 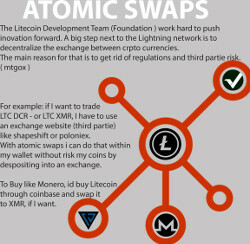 Litecoin, for example, is one of the altcoins that is making a strong effort to lead the charge for implementing atomic swaps. Charlie Lee, the creator of Litecoin made the first ever successful cross-blockchain atomic swap on September 19th, 2017. In this swap, he swapped 1 Litecoin for 55 Vertcoins. He made the swap with James Lovejoy, lead developer of Vertcoin. Since the atomic swap occurred, the price of Litecoin has roughly doubled from about $50 (9/19/17) to about $100 (12/6/17). Perhaps the most important implication of atomic swaps is that they can make it extremely easy for people to exchange money between each other. This can be beneficial for family members who need to exchange cryptocurrencies, friends, coworkers, etc. In the future, a wide variety of cryptocurrencies could be used quite regularly, so atomic swaps are going to be necessary to help facilitate seamless transactions between people for cryptocurrency exchanging. This means that very soon, atomic swaps may become a lot more popular, and they are most likely going to help a lot of people. Although atomic swaps are very exciting and have the potential to change the entire cryptocurrency landscape, there are also a number of challenges that they are facing. Currently, the users on each end of an atomic swap have to agree to a value for each cryptocurrency to be exchanged. This process is not automatic and can be difficult because the value of many cryptocurrencies can fluctuate very wildly. For example, it is common for the price of Bitcoin to rise or fall by 10%-15% in a single day. That can translate to thousands of dollars’ worth of price changes. In the future, atomic swaps could involve automatic price valuations for currencies being exchanged. But they are not there now, and a value consensus is still required between each party for the swap to go through. Another key challenge facing atomic swaps is the fact that only a handful of cryptocurrencies support them now. Eventually, this number will most likely grow exponentially. After all, as atomic swaps become more and more popular, any cryptocurrency that does not support them could risk losing market share to those who do. This could cause non-atomic swap supporting cryptocurrencies to fall behind and decrease in value. A final challenge facing atomic swaps is that they are direct competition to the established cyptocurrency exchanges. Currently, cryptocurrency exchanges make large amounts of money by charging people to convert one cryptocurrency into another. So, if they start losing business to atomic swaps, then it is possible that they could create their own in-house atomic swaps. If they do this, then this method of swapping could compete with normal atomic swapping. So, there could be a fight to determine which atomic swapping method becomes the dominant one. Atomic swaps are a brilliant invention, and they are something that is definitely helping to improve the cryptocurrency world. The faster, easier, and more reliably that people can convert one currency into another, the better. Without the ability to rapidly convert Bitcoin to Ethereum, for example, cryptocurrencies may struggle to gain mainstream acceptance, and to grow large enough to compete with the already established fiat currencies of the world. Such currencies include the U.S. dollar, the euro, the Canadian dollar, etc. Atomic swapping can help cryptocurrency use to become increasingly frictionless, while reducing fees. 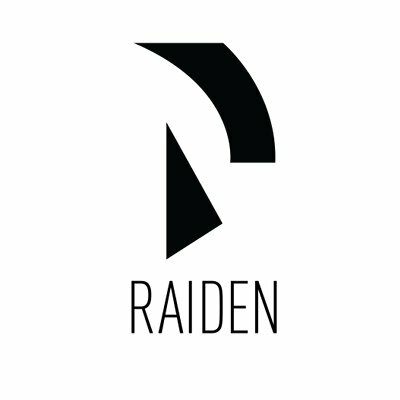 Because of this, it can potentially be a major asset for all cryptocurrencies. Easier exchangeability could also increase incentive for people to invest more in less well-known altcoins, such as Dogecoin. 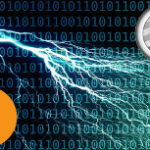 Right now, atomic swapping is in its infancy, and few people are actually using it. However, few people also used Bitcoin in its infancy, and now the price of one bitcoin is about $13,000. As with many innovations, they have to begin with the innovators, then move to the early adopters, then move to the mainstream. This process can take some time. So, for people who are expecting atomic swaps to become mainstream instantly, they may find that it takes a little bit longer than expected. But that doesn’t mean that atomic swaps won’t one day become extremely popular. Most likely, atomic swaps will steadily gain momentum as more and more cryptocurrencies begin to support them, and as more and more people complete atomic swaps. Due to the fact that they save money, are extremely useful, and are very creative, the long-term future of atomic swaps is most likely very strong. This is especially true considering the fact that the underlying technology of atomic swaps is only likely to improve in the future as well.